This week on PopMatters, I work through some issues concerning The Legend of Zeda: Skyward Sword. My brain has trouble fully grasping rapid transportation. Intellectually, I know what it means to take a long plane ride, but deep rooted instincts still make it hard to believe that I can climb into a metal tube, close the door, wait for a few hours, and have it open up to a place thousands of miles from where I started. My feeble primate brain simply has a hard time believing that, within the span of a day, it has traveled a distance that would take months (or years!) on foot. In video game terms, the plane lets me "fast travel" past the world's terrain; a landscape so vast that I have a hard time conceptualizing its size in any tangible way. My stay in economy class is essentially an inconvenient load time between two points in a largely incomprehensible environment. Games like the original Legend of Zelda do a great job of creating expansive worlds that are manageable enough to comprehend as a whole. Eventually, you'll be able to warp around the word, but there is comfort and pleasure in knowing that everything is connected and accessible via non-magical means. The spirit of this seamlessness lives on on in the best open world games. Red Dead Redemption, for example, has a massive world that still manages to feel connected. The land's various ecosystems gradually transition into one another. If you see mountain in the distance, you know you could walk there, even if you almost always fast travel to save some time. Sometimes an illusion-breaking load time is an acceptable in the interest of time. In Skyward Sword, you never have the choice of a tradeoff. 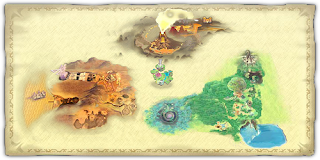 The game is densely segmented to the point where the game's various lands are literally disconnected from each other and gated behind an absurd number of load screens. None of them are long load screens, but the fact that they exist suggests the Zelda team is either behind the times from a technological and design perspective or that they simply don't care. For the sake of the franchise, I hope it's the former. It would be sad for Nintendo to settle for a segmented Zelda world, thereby abandoning to seemingly abandon one of its biggest contributions to the medium. As you may have guessed, I've been thinking about Skyward Sword for a long time. Spurred on by Tevis Thompson's writing, I'm going to formalize a few more of my thoughts in the coming weeks. For now though, I'll just say that Skyward Sword's seemingly expansive atmosphere is a lot smaller than it looks.